Here at WFS Anglia Ltd, we have built ourselves a fantastic reputation throughout Cambridge, Northamptonshire, Peterborough, Milton Keynes, Buckinghamshire and surrounding areas. This is based upon our perfect harmony between high quality workmanship with high quality service. We guarantee complete satisfaction across the board, every time, and are the smartest choice for any homeowner. Get the best, with WFS Anglia Ltd.
We have over 20 years of experience in the business, which ensures an exceptional standard of quality throughout. A standard that has allowed us to be certified members of Certass. This means that we are a fully vetted and monitored company that are in complete compliance with the latest standards of government legislation, and only offer the highest standards of workmanship. Choose a trusted, legitimate company. Choose WFS Anglia Ltd, today. We are happy to state that we are members of the prestigious Double Glazing Network. Not only are the highest standards of workmanship and customer service a requirement of membership, all members are meticulously checked and vetted by the supply chain. This ensures that quality is guaranteed, and maintained throughout. Our membership gives us access to the very best in double glazing standards, featuring world-class and industry leading standards throughout all of our products. To guarantee quality and product longevity, all of our products are backed by a 10 year manufactures guarantee. Achieve unbeatable quality, and peace of mind with WFS Anglia Ltd.
We specialise in the installation of Liniar products, which features a market-leading uPVC profile that ensures the highest standards of performance available. This 6 chambered profile utilises size-optimised chambers, internal structures and unique gaskets to not only set the standard of the double glazing industry, but to also offer innovative solutions to age-old problems. Fitted by our expert installers, you’re sure to get the best every time. Our Double Glazing Network membership means we are part of the Yale approved installer scheme. This means that you’ll have access to a high security, multi-point locking system that achieves a word-class standard of security and performance. All Yale locks that are fitted come with their comprehensive 10-year mechanical guarantee, and £1,000 security guarantee. Our whole double glazing range is installed with Pilkington Glass. We are proud to be able to offer an extensive range of design options for your double glazing, including obscure glass for added privacy without compromising on light. High performance and economically friendly, Pilkington excel in thermal efficiency, and won’t cost the earth whilst they do it. Our Certass membership ensures you’re dealing with a trusted, certified and vetted company. Membership is not automatic, and member companies are assessed against the standards set in EN17065 and specific license requirement of DCLG, and/or PAS2030. We are in complete compliance with the latest standards of government legislation. You have nothing to fear, with WFS Anglia Ltd. Guaranteeing safe and effective thermal efficiency, all of our double glazed products are assessed using a rating formula which was determined by following the method adopted by the European Window Energy Rating Scheme. This rating, linked with Certass, ensures that all of our double glazing offers our customers the very best in thermal efficiency, and guarantees its safety and effectiveness. 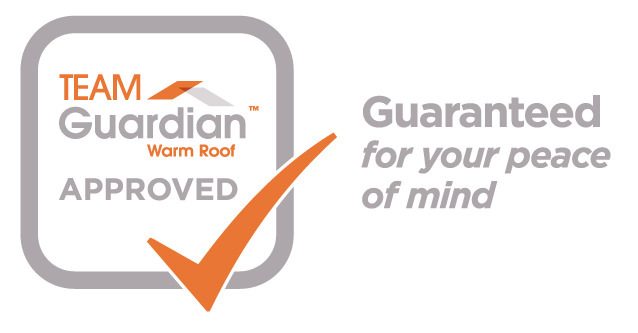 We have been confirmed as approved installers of the Guardian Warm Roof system. We proud to have achieved this title having been rigorously assessed by Guardian to ensure that we meet their impeccably high standards and attention to detail.